The art of knowing one’s mind is to track its engagements within a challenging situation that is personally significant. The problematic nature of that challenge kindles consciousness in the first place. Once aware of the problem, we can watch our minds wrestling with how best to respond. In this book, I offer curiosity as the desirable approach, trial and error as a workable method, and self-awareness as the overall goal. 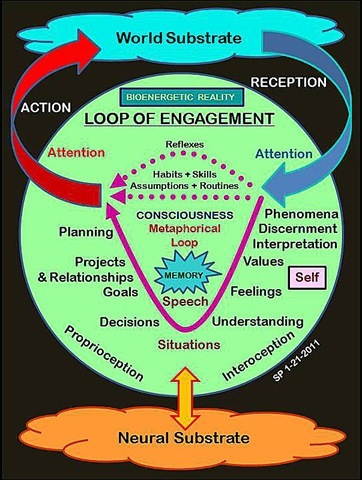 In the process, I discover several dimensions of my personal consciousness revealed in sequential order. First comes expectancy, then attention, followed by sensory figures at a useful level of detail. Leading to interpretation of those figures, their understanding within a framework of feelings and values, advancing to judgments based on the foregoing dimensions that culminate in further planning and appropriate action. 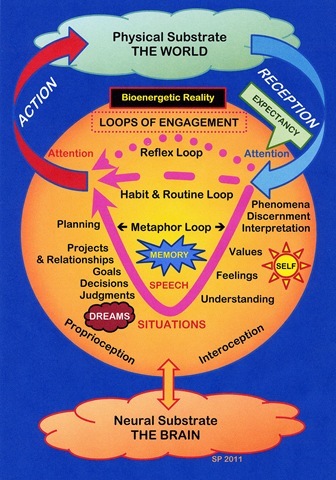 The result of this introspective method is awareness of my mental engagement with difficult situations I get myself into at various levels of my mind such as reflexes, habits, ideology, or full conscious analysis. Novelty, surprise, and curiosity promote consciousness; frustration, disengagement, and depression suppress it. Steered by personal feelings and values, consciousness empowers us to make ourselves happen in the world. Owning up to perceptual mistakes I have made in the past, I take responsibility for the workings of my own mind, producing smoother engagements in situations that make me who I am. I dedicate the book To Occupy Wall Street and the 99 percent—to all who are working to make a better life for themselves. That’s me, the original one-tracker. Can’t do two things at once. Anyway, I’m back after a long bout of working on my book. Three titles later (Know Thyself, At My Peril, Consciousness: The Book), I’ll go with the last one because that’s what it’s all about. Having worked on this project since 2006, I’ve finally got it in a form I can live with. Not only live with, but celebrate because a lot of it comes together in a coherent narrative about perception, conception, and understanding (and much else)—all based on my personal life experience. Made available to me through persistent introspection. No, I can’t write and blog at the same time. Blogging skims off the top of my thoughts; trying to put a book together requires deeper, longer study to make sure it all hangs together. But the rewards are tremendous. Finally, I’m beginning to understand my own mind. That’s one sample out of seven billion, but closer than I’ve ever come. My plan now is to give talks on my findings, before any audience that will listen. There are no illustrations in the book (except the map of my mind on the back cover), so I’m putting them into a PowerPoint. I’ll slowly share what I’ve learned in this blog after I’ve made the transition from putting the book together. Reflection 202: Don’t Read This Blog!